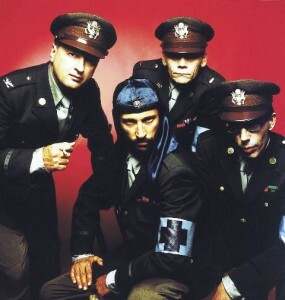 In the ’80s many bands flirted with fascist and totalitarian imagery, but only Laibach was willing to go all the way. The Slovenian group is currently in the middle of a world tour, and will be stopping in Quebec this week for the Festival International de Musique Actuelle de Victoriaville (FIMAV). They’ve recently released a deluxe version of the album they made last year, SPECTRE, which includes SPECTREMIX, an outstanding album of remixes featuring tracks from Marcel Dettmann, Diamond Version (Olaf Bender and Carsten Nicolai), Sandwell District’s Function, longtime collaborator iTurk and other reinterpretations that appeal to the more experimental aspects of the industrial group’s sound. Almost immediately after forming, the band earned dissident status in their native country with their media provocations, of which their musical endeavours are but one aspect. “We do not provoke for the sake of provoking; provocation is simply an organic part of Laibach’s character. In whatever context and media we appear, provocation somehow finds us,” they say. Quickly outgrowing the industrial music box they were put in, they founded the New Slovenian Art movement in 1984, a self-proclaimed independent state that, in addition to issuing currency and passports, includes a Department of Pure and Applied Philosophy. Even their name is provocative, as “Laibach” is the German name for Slovenia’s capital city, Ljubljana. With a name and image that harkens back to the Nazi occupation of Slovenia, audiences at home and abroad have never quite known what to make of them. Their countryman Žižek (a no less controversial and confounding figure) defended Laibach in his 1993 essay “Why are Laibach and the Neue Slowenische Kunst not Fascists?”, but this surely raises as many questions as it answers. Laibach’s performances are not ironic, but intense over-investment in their ideology. We’ve come to expect ironic detachment from artists and musicians, but irony can never really be effective precisely because we expect it, because everyone can see right through it. 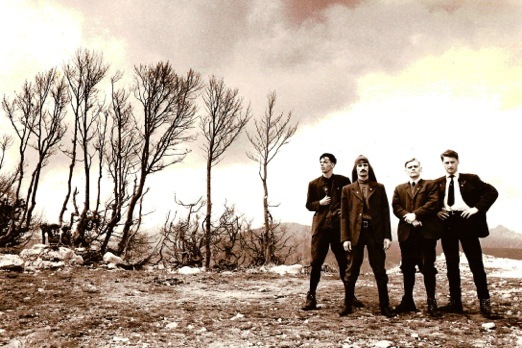 Laibach adopt totalitarian elements in earnest, manifested not only in their image but in the nature of the members’ anonymity and collectivism. “We work as a team, with collective spirit, according to the model of industrial production and totalitarianism, which means that the individual does not speak — the organization does. Our work is industrial, our language political.” Laibach borrow from not only totalitarian imagery and western iconography but outright pilfer capitalist popular music. Functioning as guerrilla media interventionists, each project affects revelation through exaggeration of the latent political subtext of their source material. The best example of this must be their 1988 album covering the Beatles’ Let It Be, in which, a few short years before brutal wars would tear the Balkans apart, the line “Get back to where you once belonged” takes on a sinister significance.